This article is about the type of building. For other uses, see Kiosk (disambiguation). 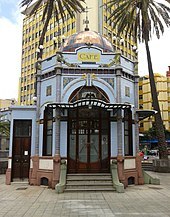 Late Art Nouveau kiosk (1923) in Las Palmas de Gran Canaria. A kiosk (from Persian kūshk) is a small, separated garden pavilion open on some or all sides. Kiosks were common in Persia, the Indian subcontinent, and in the Ottoman Empire from the 13th century onward. Today, there are many kiosks in and around the Topkapı Palace in Istanbul, and they are still a relatively common sight in Balkan countries. 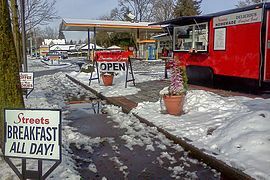 The word is now applied to small booths offering goods and services and to freestanding computer terminals. Modern vending kiosk in a train station in Hyogo, Japan. In the Western hemisphere and in English-speaking countries, a kiosk is also a booth with an open window on one side. 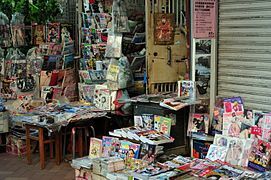 Some vendors operate from kiosks (see mall kiosk), selling small, inexpensive consumables such as newspapers, magazines, lighters, street maps, cigarettes, live and frozen fishing bait and confections. An electronic kiosk (or computer kiosk or interactive kiosk) houses a computer terminal that often employs custom kiosk software designed to function while preventing users from accessing system functions. Indeed, kiosk mode describes such a mode of software operation. Computerized kiosks may store data locally, or retrieve it from a computer network. Some computer kiosks provide a free, informational public service, while others serve a commercial purpose (see mall kiosk). Touchscreens, trackballs, computer keyboards, and pushbuttons are all typical input devices for interactive computer kiosk. Touchscreen kiosks are commercially used as industrial appliances, reducing lines, eliminating paper, improving efficiency and service. Their uses are unlimited from refrigerators to airports, health clubs, movie theaters and libraries. Etymological data points to the Middle Persian word kōšk 'palace, portico' as the origin, via Turkish köşk 'pavilion' and French kiosque or Italian chiosco. 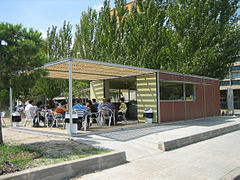 A kiosk is an open summer-house or pavilion usually having its roof supported by pillars with screened or totally open walls. As a building type, it was first introduced by the Seljuks as a small building attached to the main mosque, which consisted of a domed hall with open arched sides. This architectural concept gradually evolved into a small yet grand residence used by Ottoman sultans, the most famous examples of which are quite possibly the Tiled Kiosk ("Çinili Köşk" in Turkish) and Baghdad Kiosk ("Bağdat Köşkü" in Turkish). The former was built in 1473 by Mehmed II ("the Conqueror") at the Topkapı Palace, Istanbul, and consists of a two storey building topped with a dome and having open sides overlooking the gardens of the palace. The Baghdad Koshk was also built at the Topkapı Palace in 1638–39, by Sultan Murad IV. The building is again domed, offering direct views onto the gardens and park of the Palace as well as the architecture of the city of Istanbul. Sultan Ahmed III (1703–1730) also built a glass room of the Sofa Kiosk at the Topkapı Palace incorporating some Western elements, such as the gilded brazier designed by Duplessis père, which was given to the Ottoman ambassador by King Louis XV of France. 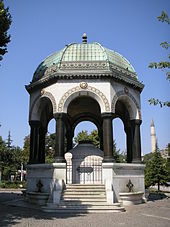 The first English contact with Turkish Kiosk came through Lady Wortley Montagu (1689–1762), the wife of the English ambassador to Istanbul, who in a letter written on 1 April 1717 to Anne Thistlethwayte, mentions a "chiosk" describing it as "raised by 9 or 10 steps and enclosed with gilded lattices". European monarchs adopted the building type. Stanisław Leszczyński, king of Poland and father-in-law of Louis XV, built kiosks for himself based on his memories of his captivity in Turkey. These kiosks were used as garden pavilions serving coffee and beverages but later were converted into band stands and tourist information stands decorating most European gardens, parks and high streets. Conservatories were in the form of corridors connecting the Pavilion to the stables and consisting of a passage of flowers covered with glass and linked with orangery, a greenhouse, an aviary, a pheasantry and hothouses. The influence of Muslim and Islamo-Indian forms appears clearly in these buildings and particularly in the pheasantry where its higher part is an adaptation of the kiosks found on the roof of Allahabad Palace, as illustrated by Thomas Daniell. Today's conservatories incorporate many Muslim elements, although modern art forms have shifted from the classical art forms that were used in earlier times. ^ Oxford English Dictionary, 1901, s.v. ^ MacKenzie, D. N. (1986). A Concise Pahlavi Dictionary. London: Oxford University Press. ISBN 0-19-713559-5. This page was last edited on 23 January 2019, at 21:22 (UTC).